By buying this product you can collect up to 8598 bonuspoints. Vändskiva, elektrisk, passar både likström 2-räls system och Märklin 3-räls system, komplettera med fler lösa påsticksräls för fler anslutningar. Roco artikelnummer 42616 och 42617, innermått: 253 mm, yttermått: 307 mm. Turntable with electric below-baseboard propulsion mechanism and control unit. Suitable for all NEM (European model railway standard) compatible two-rail DC and three-rail AC model railways. Bridge length: 253 mm; this is equivalent to 22 m on an original railway. The minimum angle between two track connections is 9 degrees. Spacers for 1°, 3°, 6° and 9° divisions are supplied with the turntable. This means that any division from 9° upwards in 1° stages between the track connections is feasible. The maximum number of track connections that can be made is 40. Four track connections for two-rail DC operation are supplied with the turntable. Further track connections are available as accessories (42616). 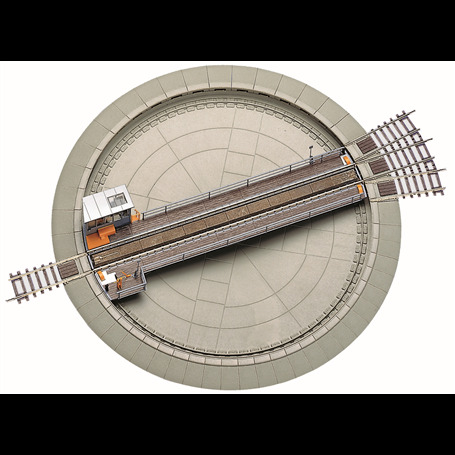 If the turntable is to be used with a three-rail AC model railway, your specialist dealer will exchange the enclosed original DC pack to a pack of three-rail AC track connections (42617). 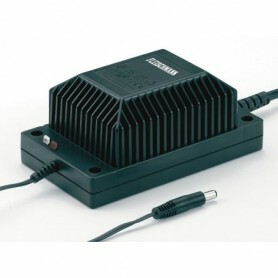 The turntable bridge drive is powered by 14 V AC. Depending on the system used, traction power supply will either be DC or AC. The turntable is equipped with a control unit for preselecting the direction of rotation and starting the turntable rotation. One 1-meter 5-pole cable (connection between transformer and control unit) and one 2-meter 8-pole cable (connection between control unit with the turntable) are enclosed. Required installation opening: 280 mm. Installation depth measured from table top edge: 50 mm. External diameter of the turntable without track connections: 307 mm. Turntable bridge length: 253 mm. Suitable for all locomotives up to a total wheel base of 250 mm. * The terminal loop module is required when using the turntable in DCC mode (digital).